After years of preparation and study, we now approach the one year anniversary of the official incorporation of Akron Promise, Inc., I want to take the opportunity to update you on the progress that we have made in our efforts to create a unified culture of education in the City of Akron. We would like to thank our community for enthusiastically embracing this idea. We know that it will require all of us working together to help Akron's kids access family and academic support services leading to good educational and career opportunities. We recently returned from an informative and engaging meeting with Say Yes To Buffalo and the Say Yes to Education national team. We are still processing all we learned and will be sharing more about that visit in the coming weeks. Please join our official mailing list by signing up here! If you wish to volunteer with Akron Promise, please let us know! Akron Promise, Inc. has been incorporated as an Ohio not-for-profit corporation and has been recognized by the IRS as a 501(c)(3), Non-Profit Corporation. In October nine people from Akron attended the annual convention of Promise programs, held in Washington, D.C. The sharing of information was of great value to us all. Some of us were invited to the White House for the final community college convening, under President Obama. Some were also invited to a reception at the Vice-President’s residence. It was a wonderful surprise to have Dr. Jill Biden and Vice-President Joe Biden show up, speak to the group and offer their time for pictures with each of the 100 in attendance. The convening and reception were to thank those in attendance for their work to make post-secondary education accessible to all, and to encourage us to keep at it. Tom Ghinder participated in the steering committee and working groups for this Akron Public Schools initiative. Based on other districts’ successes, APS is forming learning communities for grades 9-12 to better prepare students for employment. Add more members to the Board of Directors. Define program mission, vision and program parameters. Work with Akron Public Schools to establish our working commitment and relationship. 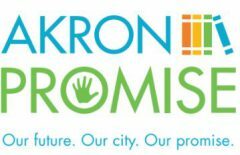 Work with the City of Akron and other stakeholders to build Akron Promise as a community effort. Keep talking to members of the community about our organization. Please follow us on Facebook and Twitter to stay informed as we make progress in our second year! Next Next post: Summa Donates Lab Coats. What Can Your Business do?